Not since 11/22/63 have I been so engrossed, and “pulled in” to a book as I was for Joyland. It is the summer of 1963 and college student Devin Jones, through his 63-year-old self, narrates to us the details of the Summer when he was 21 and worked at Joyland Amusement Park. This is a crucial Summer for him, as he is trying to recover from the broken heart by his first love, Wendy. But, it is also his “coming of age” Summer, if you will. 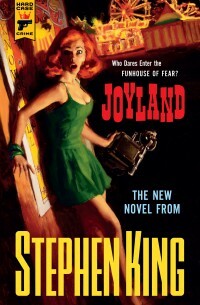 Now, unlike the typical horror we are used to from King, Joyland is more of a murder mystery. As Devin becomes accustomed to the “Carny” way of life and discovers how things are done in the park, as well as learns “The Talk,” he also learns of a murder that happened there, and that there is a classic “Horror House Ghost” of the murdered girl, Linda Gray, who dozens of employees claimed to have seen. As you follow Devin through the Summer, you also meet his new friends, and with usual King style, become emotionally invested in each one. As the Summer goes on, and Devin finds his nitch at the park, he also starts to put pieces of information together and begins his journey into the murder mystery, as well as finding out dark secrets within the park. The tension mounts, allowing for a page-turning, can’t put the book down experience, reaching a climax of discovering the killer. I thoroughly enjoyed reading this book. The pace was fantastic and the story flowed well. It is an easy read that keeps you engrossed from the first page to the last! I am also so excited to see that this book will be adapted into a film, reportedly to be directed by Tate Taylor (The Help). As a note, this book is not currently available in eBook form.